Daring here is not an adjective of God. Here it is a verb. Do you ever dare God? Would you ever dare God? Are you brave enough to dare God? I dare you to. Forrest Gump is a real person. His real name is Jimbo Meador. I know this because my husband John had dinner with him. The inventor of the game of paintball (John’s career) is a childhood friend of Jimbo. I say this only as a brag moment. That is a braggadocious way to segway about one of the scenes from the movie, Forrest Gump. I don’t know if Lieutenant Dan was real or not (or if Jenny was real or not) because John didn’t ask such questions at his unexpected dinner with Jimbo. Jimbo just dropped in for dinner with his childhood friend. John just happened to be there. Thus John unexpectedly had dinner with the real Forrest Gump. The scene is when the hurricane blew in. 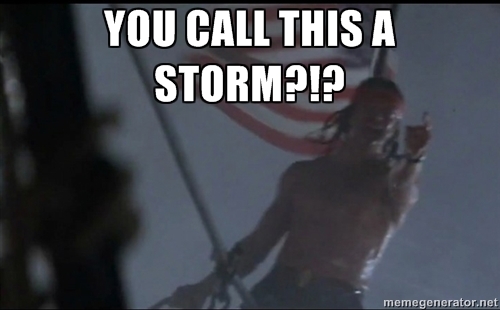 Lieutenant Dan made himself vulnerable to God during that hurricane. He let out all of his anger. And then he found peace. God can take all of your anger. Yes, really. All of that anger that you’ve been stuffing down. All of the “supposed to’s” that you are angry that never came to be. All of the pain that the unfairness of life has caused you. Let God have it. Every cuss word you’ve been holding in. God can take it. Trust me. I know this from firsthand experience. I wasn’t damned. I wasn’t cursed. Psalm 18 became real to me (and still is). I have screamed, My problems go from bad to worse. Oh, save me from them all! Feel my pain and see my trouble. Psalm 25:17-18a. I have cried, Have mercy on me, Lord, for I am in distress. My sight is blurred because of my tears. My body and soul are withering away. I am dying from grief; my years are shortened by sadness. Misery has drained my strength; I am wasting from within. Psalm 31:9-10. On the other side of it, my uncertain faith grew stronger and I felt braver because I learned God still loved me and hadn’t forgotten me. No matter how much I have hurt, this is always true. But even in darkness I cannot hide from you. Psalm 139:12. Because God can take it. God can take your emotional meltdown towards him. This is not disrespectful towards God. This is not showing a lack of faith. God can take your emotional meltdown. In Psalms it seems David did this a lot. It is okay. Because like fictional character Lieutenant Dan, you will be changed. You will know God to be true. And that God loves you. And that God is for you. Part of God being true is that he will not punish you for this emotional meltdown. He will not punish you for verbalizing your real feelings—even if they are accompanied with cuss words. I believe he actually is finally able to draw closer to you—because you have made yourself vulnerable to him. In my distress I prayed to the Lord, and the Lord answered me and rescued me. The Lord is for me, so I will not be afraid. Psalm 118:5-6a. Do you dare make yourself vulnerable to God? If you do, you will find your certain faith to become uncertain yet closer to you than ever. Do you dare to live this way? As one who lives this way, I dare you.